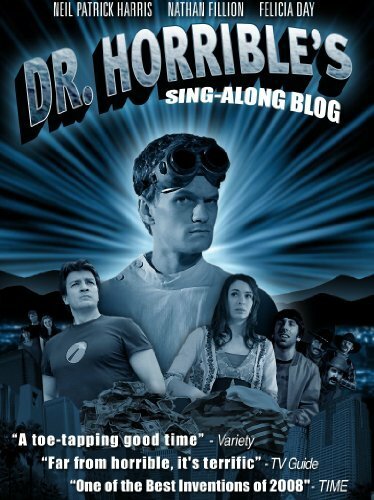 TMATNB: Dr Horrible’s Sing Along Blog (2008) – Hooray For Movies!! Synopsis: Aspiring supervillain Dr Horrible (Neil Patrick Harris) must balance his career, his loathing of nemesis Captain Hammer (Nathan Fillion) and his pursuit of a beautiful do-gooder (Felicia Day), through the medium of video-blogs and melodies. Nothing clears a fuzzy head like a geeky musical about a misunderstood super-villain. Especially when the supervillain is Neil Patrick Harris and his nemesis is a super cheeseball played by Nathan Fillion. Ever asked the question: what if Ben Folds and Megamind had a baby? I know I hadn’t before this. But if I had then the answer would be Dr Horrible. The love child of geek-emo-piano king Ben Folds and blue animated supervillain would be Neil Patrick Harris’s Dr Horrible. Or alternatively, this is what happened to Doogie Howser MD in the long term. Whatever floats your boat. Dr Horrible’s Sing Along Blog was a 3 part web series streamed on the net in 2008 that is now available as 42 minute mini-movie on Netflix US. Before today I had never heard of it as it totally passed me by at the time, even though it apparently got a lot of press coverage and accolades. I have no idea what I was doing in 2008 that meant I missed it. Possibly changing jobs?……Let’s say it was that. Anyway, the whole 42 minutes are pure Joss Whedon; geek comedy, misunderstood anti-heroes, great one liners and when needed, just the right amount of cheese. The narrative is split in three ways; the first is when Dr Horrible breaks the fourth wall to talk directly to us. This is done by way of him streaming his thoughts on a video blog, a device which opens up a great scene with him answering fan mail; the second is normal spoken interaction between the three leads; and the third is the traditional musical interaction of the characters singing the exposition. The music and lyrics have a gorgeous geek laced romance about them and the melodies are very Ben Folds-y. Watching Dr Horrible sing forlornly about being misunderstood and not being able to get the girl made me think about the brilliant episode of Futurama when Fry wins Robot Devils hands so he can write an opera about Leela. The balance of emotion and comedy in that episode that made me genuinely a bit teary at the end, made it one of my favourite in Futurama. So I loved the musical numbers in this. Neil Patrick Harris great as Dr Horrible but it is Nathan Fillion, as usual, who steals the scenes as macho jerk-off “hero” Dr Hammer (Corporate Tool….). He embodies cheese ball and delivers his lines with that distinctive Fillion smugness that he does so well. God I love that dude. He should be in literally everything all the time. At 42 minutes this is the perfect way to shake of the haze of the night before with a big pot of coffee and stack of bacon/turkey bacon/whatever people who don’t eat bacon eat on a Sunday morning. Porridge? Can you eat a stack of porridge? How would you stack porridge? I don’t know. Stack something and then eat it whilst watching Dr Horrible. Conclusion: I defy you not to sing along. Director: Joss Whedon – If you don’t know what Joss Whedon has done and who he is then I honestly don’t know what you’re doing here. Go and look him up, slap yurself, and then come back. Dr. Horrible’s Stun Ray, which he later turns into a Death Ray, is the stun gun carried by Alliance troopers in Firefly, held upside-down. In an interview, Nathan Fillion said that when Joss Whedon called to offer him the part of Captain Hammer, Fillion saw Whedon’s name on his caller ID, immediately picked up the phone, and said “Yes!” Whatever Whedon was calling to talk to him about, his answer was going to be yes. In the opening sequence, during which Dr. Horrible is talking directly to camera, manyJoss Whedon fans mistakenly believed that the out of focus shape hanging in the window on the left was a model of the spaceship Serenity, a nod to Whedon’s show, Firefly. However, it was just a line of pots and pans hanging in the window. Shoving Buddies Gets Awarded? Whaaaaaaaaat? If you get a chance to check out the commentary track. Its an all singing one and it’s awesome.